Last night I finally did it. I took the 2 huge bowls of tomatoes that have been sitting on my counter top for 5 or more days and decided I better take care of them. By taking care of them, I mean making canned salsa. Really, it was why I planted a garden in the first place. I was determined this last spring to learn how to do some canning so I planted things I knew would get used. Well...that was last spring when I wasn't 7 months pregnant, and it wasn't 95 degrees outside! My non-heat tolerant self was N.O.T in love with the idea so much anymore. Well, I finally bit the bullet and guess what? It was every bit as much work as I thought it would be! Gah! It took me 4 long hours to prep and chop all of the vegetables. Then comes the boiling of the salsa, ladleling (sp?) it into the jars and then boiling, again, everything in the cold pack canner. 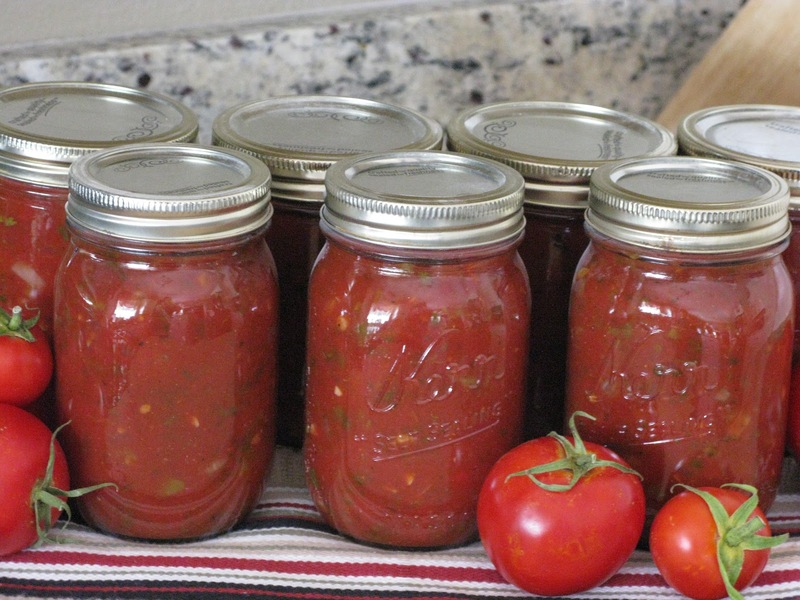 Seven pints of homemade salsa. I did it, it is one hundred percent done. I'm still trying to clean up my kitchen from the huge mess I made. If you are interested in self torture with, I admit, some small sense of satisfaction, here's a recipe you might want to try. It's my mother's who laughed her head off when I called to complain. I swear she can be really cruel hilarious sometimes. Must be payback for my youth, and the torture I caused? Combine all ingredients in a large sauce pan. Bring to a boil. Reduce heat and simmer for 30 minutes, stirring occasionally. Ladle hot into pint jars, leaving 1/2 inch headspace. Adjust lids and process in a boiling water canner. I sterilize the jars and lids before putting the salsa into them. Then I process in the canner. 20 minutes at 1,001-6000 ft.
15 min. at 0-1000 ft.
25 min. above 6,000 ft.
Well, that's my latest adventure. wonderful ! I love salsa ! still waiting on my tomatoes to ripen !!! It looks and sounds very tasty! I have tried to seal canning jars in hot water before but I can't seem to get it right. Maybe I don't have the patience but the lids never pop. Do you have any advice for this newbie? If so...maybe I will try your recipe! LOL! I've been looking for a good salsa canning recipe that calls for something other than vinegar for the acid. Vinegar is for pickles in my opinion. Lemon juice sounds much better! Ha Ha, oh I feel your pain! It all sounds like a great idea until bucketsfull of veggies are sitting on your counter laughing at you ready to rot away and then you HAVE to deal with them weather you want to or not. I had a fight with some peaches last weekend....I am still not sure who won. I've been meaning to do this FOREVER :) it does look like slot of work..but how great to enjoy your salsa and chips whenever?! the food processor is your friend for salsa, especially the onions and cilantro :D recipe looks delicious.